If you prefer a classic, compact writing instrument, then you’ll enjoy Lanier’s handcrafted Slimline wood Pencil. So many of today’s mechanical pencils are bulky and heavier to handle, but our handcrafted wood Slimline Pencil not only offers a lightweight slim design and balanced writing solution, but also some of the finest writing that you can find. 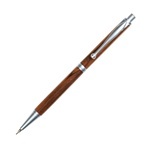 You can also personalize your Slimline Pencil by picking out the exotic hardwood and plating option for your pencil. 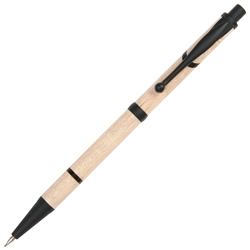 Your perfectly balanced Slimline Pencil can be customized so it is truly “your pencil”. You can choose from over sixty exotic woods from around the world including Australia, the Dark Continent of Africa, Asia and even the frontier forests of the United States. Each pencil is hand turned, hand polished and then coated with a high gloss finish for everlasting beauty and durability. Lanier’s custom made wood Slimline pencils are available in a range of plating options including 24kt Gold and Rhodium that will enhance the wood’s everlasting beauty.Our Slimline Pencil uses .7mm pencil lead, and features a smooth, trouble-free precision click lead dispenser mechanism. It also features a concealed eraser under the cap when you need to clean up a mistake. Lanier’s handcrafted Slimline Pencil is always in high demand as promotional pencils, including executive gifts, corporate awards, prizes and also gifts for that special occasion. You can personalize your mechanical pencil for yourself or as a gift, by having your pencil engraved, in addition to a Rosewood or Maple gift box. You can also order a matching Cross Style Slimline Twist Pen to make your gift or collectible even more special.